Why a National Hydrographic Service? Orders for printed copies (this publication is available only as a .pdf file). Hydrography involves the surveying and mapping of rivers, lakes and oceans which gives us information about what the seafloor and movement of water above that seafloor looks like. Hydrographic information is typically published in the form of nautical charts and sailing directions both in hardcopy and digital form. These nautical publications are critical for providing mariners with the information they need to navigate ships safely and efficiently. Used in conjunction with meteorological information, nautical publications provide a basis for decisions on where and when a ship can be taken. High resolution hydrographic information in the form of seabed imagery provides a basis for engineering decisions on matters such as where to locate a sub-sea pipeline or communications cable. 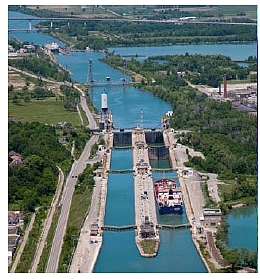 Much like towns and cities which have grown because of their close proximity to railroads, superhighways and airports, access to navigable waters has provided the earliest cornerstone for discovery and economic development the world over. But what makes waters navigable? Fundamentally it is knowledge of water depth, hazards, tides and currents that enables navigation. Hydrographic information is of course the basis for this knowledge however it may be communicated. What makes waters navigable also makes waters safe and thus ensures the preservation of Safety Of Life at sea (SOLAS), the “sea room” to run out a storm or to find an alternate ice free course to steer are all supported by sound hydrographic information. Bringing goods to and from market by sea and access to fisheries, sources of energy and other natural resources at sea depends on sound hydrographic information. When “just-in-time” service is not so critical, the economic efficiencies and reduced carbon footprint associated with marine transportation can outweigh all other modes of transportation. Frontier exploration and development, harvesting and extraction, transportation, national sovereignty and defence, all constructs supporting economic development are enabled by hydrographic information. Access to and an understanding of land, including submerged lands, is essential to claiming, developing and realising economic sustainability. Surveyors have always played a role in supporting land tenure and development and thus provide an essential connection between surveys, mapping (charting) and the economy. The International Federation of Surveyors (FIG), through the efforts of the Commission 4 workgroup 4.4 on Capacity Building and the Economic Benefits of Hydrography, has sought to bring awareness and promote the role of hydrography as an essential investment in economic development. This publication provides a snapshot of the workgroup’s efforts from various conferences and symposia to stimulate thought and exchange ideas in this regard. I would like to thank our working group chair, Mr. Gordon Johnston, the authors who have contributed to this working group through various FIG Working Weeks and Regional Meetings and those authors whose work has been selected for this publication. This publication aims to fulfil the objective of FIG Commission 4’s Working Group 4.4, to develop an awareness of hydrographic surveying and raise its profile in terms of how it can benefit society, cultures and developing states. In the process of developing the project, the Work Group identified a general lack of information and research to support the case for Hydrography across different uses, businesses and interests. Additionally, the FIG Costa Rica Declaration on Pro-Poor Coastal Zone Management (FIG Publication no. 43, 2008) has developed the interest and the importance of the coastal zone and its associated marine areas. Consequently Work Group 4.4 has developed this document as a compilation of papers, case studies and supporting articles to illustrate the tangible benefits of hydrography and the potential economic benefits that may be derived from developing and maintaining an appropriate hydrographic capacity. This publication covers three different areas concerning the provision of Hydrographic survey capability. The first 3 papers relate to institutional and national Hydrographic services and how these can generate a basis for developing and generating good economic conditions. The papers outline the inherent value of Hydrographic surveys and illustrate the context of Hydrography in terms of potential stakeholder benefits and how Hydrographic information can have a positive influence. The second series of articles provides a number of case studies from around the globe that serve to illustrate how Hydrography has been able to provide a basis for generating economic growth and benefits. The final section of three papers concentrates on the development of the personnel to establish a sustainable Hydrographic capacity. The papers provide example experiences of achieving recognition at the International Standard level and combining with industry to create cost efficient and effective training solutions in the work place. Table 2: Presentations on Capacity Building and the Economic Benefits of Hydrography. 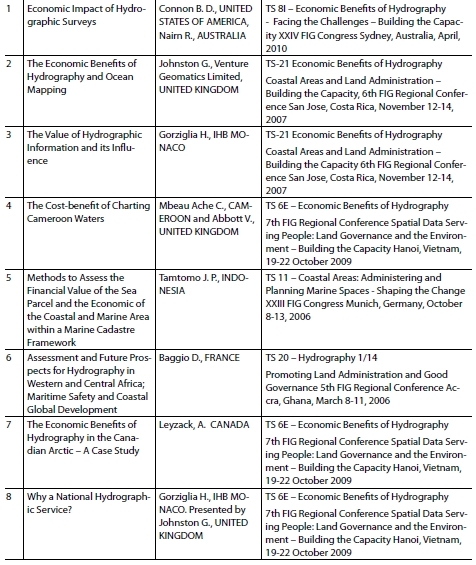 The papers listed in table 2 present case studies and examples of the economic benefits of Hydrography. These can be found in the FIG Surveyor’s Reference Library (http://www.fig.net/srl/), and may be accessed directly via the hyperlink provided with the outline for each in technical summary section of this document. This has proven to be a very interesting initiative as the links between Hydrographic services and products would appear to have a logical sequence and relationship step. However the direct nature of the benefits has not been so easily described. What has become apparent is the wide range of locations and countries where the practice of Hydrography is having positive benefits. In developing this document, Working Group 4.4 has gathered together a group of articles and papers to illustrate the potential benefits of hydrographic surveys and the products they create. Early in the 1990’s both Canada and Australia undertook reviews of the contribution made by their Hydrographic Services. They offered a very positive situation in terms of the benefits at a national level; however these studies failed to put precise monetary figures on the value gained from a specific level of investment. More recent papers and articles promoting Hydrography, as well as the UN conventions mandating hydrographic services, have also provided general support but still some links are missing in the value chain from investment of resources to the benefits to the wide array of potential stakeholders. 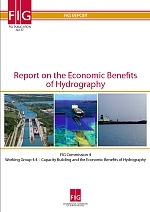 This document aims to rectify this shortcoming and provides a useful resource that connects Hydrographic services with their ultimate benefits both in direct and indirect terms. Figure 1: The world map illustrates the distribution of the case studies and the venues where the Working Group Technical Sessions took place between 2007 and 2010. 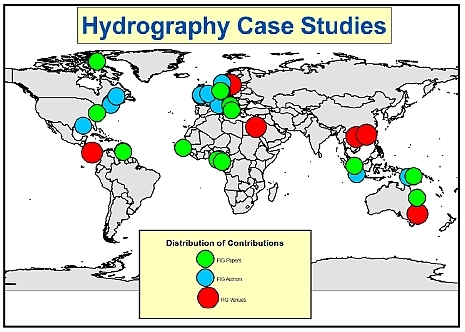 As can be seen the FIG venues (Red circles) have played host to a truly globally distributed set of Case Studies (represented by the Green circles) presented by the authors (Blue circles) also representing a wide distribution. The first few papers have outlined the general concept of Hydrographic services and their benefits at a national level. The International Hydrographic Organisation (IHO) maintains key links to international bodies and governments and has a key objective to increase hydrographic capacity globally. FIG also supports the development of communities and a number of the case studies in this compilation illustrate the very real and direct benefit that hydrography can bring to the local community, whether they are in the high arctic or in an equatorial region. The evaluation of the costs and then the potential benefits require a systematic approach to avoid the statement “that there is a clear and positive benefit gained from good hydrographic survey services” simply becoming a cliché. Several papers address this technical element. Some recent studies such as the review of the recent national survey by Ireland have provided some very useful information and the papers by Ache & Abbott and Tamtomo provide useful mechanisms to assess the value and benefits. Having access to resources is one thing but there is also a need to ensure that there are suitable people with appropriate competencies and qualifications. The papers at the end of this compilation have been selected to provide an insight to the varied ways to build capacity, generate and sustain a skilled workforce. The Standards of Competence for Hydrographic Surveyors and Nautical Cartographers, as maintained by the FIG/IHO/ICA International Board, as well as the growing links between educational establishments, training facilities and industry are of great benefit to Hydrographic Practice. Consequently investment in Hydrographic training will benefit Hydrography which in turn will benefit the wider community. As this compilation highlights only a selection of the papers, presentations and articles generated over the last 4 years, the remainder can be found through the FIG website either in the Surveyors Reference Library section or in the Proceedings of the various meetings and events. The Economic Benefits of Hydrography have been described and clarified throughout the term of this working group and it is apparent that the benefits from Hydrography are huge compared to the investment where returns have been assessed as generally exceeding a ratio of 5 to 1 over costs. However it should be recognized that this figure was arrived at by considering all the stakeholders available to use and adopt the services and products. So for prospective government departments, expanding hydrographic offices, services and other potential stakeholders there are benefits that outweigh the investments and this must surely be of interest, certainly good news for the profession, the end users of nautical publications and other Hydrographic products , maritime communities and those who dwell within the world’s coastal zones. Key words: Hydrography, economics, bathymetry, coastal zone management, hazard mitigation. This paper discusses the inherent value of hydrographic services and bathymetric surveys beyond the obvious benefit of improved nautical charts. These direct and indirect benefits are not traditionally recognized for their economic value to coastal States as they are difficult to quantify. Also their actual value is somewhat dependent on the specific economic, recreational, and defence activities of each coastal State. Convincing governments to invest in hydrography and bathymetry can be difficult. However even without quantitative analysis, there is strong logical and qualitative argument that recognizes the critical value of hydrographic services as an essential element of national infrastructure and a critical enabler of other maritime activities. Thus, providing government with information detailing the second and third order benefits of bathymetric surveys and hydrographic services may further influence investment in these essential enablers of economic growth. To generate discussion around the need and justification for the development and sustained use of hydrographic services to support and expand a national, regional or local economy, this paper sets out to examine the current status of hydrography in several areas in relation to a number of disciplines and user groups. The use and benefit form Hydrographic data and products for stakeholders are often promoted however there appear to be few direct and tangible outcomes rather than simply vague links and indirect consequences. This paper aims to offer a summary of some example assessments. For the increasingly competitive market place of the global economy, coupled with a consumer group of increasing knowledge and awareness of environmental issues the baseline and framework for many activities relies upon good quality, reliable and objective data sets. The paper offers some thoughts on how modern Hydrographic data and products as well as the Hydrographic community could influence and aid in the strategic development of areas and regions by working with the various stake holders. Key words: capacity building, cartography, coastal zone management, engineering survey, hydrography, marine cadastre, real estate development, risk management. The International Hydrographic Organization (IHO) and its objectives of aiming at improving hydrographic capabilities worldwide are introduced in this paper. Hydrographic development contributes to safety of life at sea and the protection of the marine environment, while also contributes to sustainable development. Highlights the importance of capacity building and invites countries in the region to consider joint work with the Meso American and Caribbean Hydrographic Commission, the regional structure of the IHO. The definition of hydrography and nautical chart and nautical publications is provided to fix the scope of the paper, including some economic characteristics of these products. The paper makes to these products and identifies some elements of main value. These elements are also cross-referenced with several other different activities for which such information is required. The influence of hydrographic information has in the decision making process of different activities of national importance is described and some conclusions are offered as invitation for further consideration. The relationship between commercial, insurance and environmental costs. The initial investigation compares Cameroon with other developing states. From a description of the waters and trade in Cameroon, the paper addresses resources in terms of ports, fishing, hydrocarbons and environmentally sensitive areas. It describes the role of navigational charts and its contribution to the growth of a state’s economy. In order to determine the benefit of charting Cameroon Waters this paper provides a general assessment of the economic value and importance of shipping operations out of the three major ports in Cameroon, including fishery landings and foreign commerce. The estimated cost associated with implementing a hydrographic programme for Cameroon is examined and a cost- benefit ratio of 1:8 determined. Most coastal countries in the developing world especially on the West coast of Africa are still to appreciate the relationship and importance of hydrographic surveying to their economies. It is hoped that this paper will benefit countries in transition to understand this relationship and embrace the importance of implementing hydrographic programmes in their countries and charting their own waters. La relation entre les coûts commerciales, l'assurance et les coûts environnementaux. L'enquête initiale compare le Cameroun avec d'autres États en développement. A partir d'une description des eaux et du commerce au Cameroun, le document traite des ressources en termes de ports, pêche, hydrocarbures et les zones écologiquement sensibles. Il décrit le rôle des cartes de navigation et sa contribution à la croissance de l'économie d'un État. Afin de déterminer l'avantage de la cartographie des eaux au Cameroun, ce document présente une évaluation générale de la valeur économique et l'importance des opérations de transport maritime sur les trois grands ports au Cameroun, y compris les débarquements de la pêche et le commerce extérieur. Le coût estimatif associé à la mise en œuvre d'un programme hydrographique pour le Cameroun est examinée et un ratio coûts-avantages de 1:8 déterminée. La plupart des pays côtiers du monde en développement en particulier sur la côte occidentale d'Afrique sont toujours à apprécier la relation et l'importance des levés hydrographiques pour leur économie. Il est à espérer que ce document sera bénéfique pour les pays en transition de comprendre cette relation et d'embrasser l'importance de la mise en œuvre des programmes dans leur pays d'hydrographie et de cartographie de leurs propres eaux. Within a “land” cadastre, methodologies of property valuation were not new drawn back to year 2,000 B.C. when the Egyptians inhabited lands surrounds the Nile. The economic valuation of coastal and marine areas was not new since Turner et al. (1998) introduced it; nonetheless it is a newborn within a marine cadastre. This paper elaborates a broad sense of a marine cadastre definition, coastal and marine parcels, and a method to assess the financial value of the parcels as well as the economic value of the areas and resources. In the marine environments, the value of the parcel is usually tricky, because it is not the land that could “easily” be assessed. An appropriate way is to use the Financial Valuation Method (FVM) to assess the projects, activities, and or resource products or uses in the sea parcel. Dixon and Hufschmidt’s formula (1986) is still widely used today to calculate NPV (Net Present Value), B/C ratio, and IRR (Internal Rate of Return). Meanwhile, the economic value of the coastal and marine area is measured by two tools, i.e. Total Asset Value (TAV) of the area, and Total Economic Value (TEV) of the zone; both consist of (DUV + IUV + OV + EV + BV) with different indicators. For specific reference, this paper takes a case study in the coastal and sea areas of Bintan Island, Indonesia. This region has been exploited over years. The mining of sea sands and the devastation of mangroves and coral reefs have brought about vast detriments. The terrestrial and sea sands exported to Singapore islands for “filling” the sea water (some say “reclamation” as a misleading term) of its shores, so the islands become wider. The coastal and shallow sea areas have also been degraded caused by the misuses of the mangroves and coral reefs. Learning from these cases, this paper also suggests the role of a marine cadastre in the management of coastal and sea resources and areas. Key words: Hydrographic and maritime charting, Africa, EAtHC, CHARMER, COAST CHART. This article provides some information collected by a team of international hydrographic experts representing the International Hydrographic Organisation (IHO) Eastern Atlantic Hydrographic Commission (EAtHC). Goals of this initiative were to audit and advice in West and Central African countries, in order to determine what could be done to improve maritime charting not only for safety of navigation but also for sustainable coastal development in the area. Conclusions of this international assessment can be reported through three kinds of proposals: −proposals for co-ordination and capability building −proposals for technical assistance −proposals for agreement (SOLAS). Three main phases for developing hydrographic surveying and nautical charting capabilities are given. An international definition study for “maritime highways” from Gibraltar to Congo, called CHARMER1 is going to be carried out. It will be an opportunity to protect coastal sensitive areas and also simultaneously to develop hydrographic capabilities for coastal states. At the same time, the project COAST CHART intends to determinate an exact coast line from Senegal to Congo. Lessons learned this experiment could be applied to other maritime areas of the world. Remote communities in the Canadian Arctic are accessed and re-supplied by air and by sea. The latter mode of transportation presents a more cost-effective solution for re-supply and in recent years, an extended navigation season has seen an increase in both cargo and passenger vessel traffic. 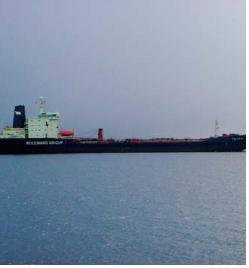 Traditionally, communities in the Western Canadian Arctic have been re-supplied by barge and tug however deep draught ocean-going vessels are now starting to compete for service to these same communities. The cost savings realised from deep draft vessel re-supply are significant and modern hydrographic surveys are an enabling factor for deep draft access to Arctic trade routes, for both cargo and passenger liners, especially where under keel clearance is a concern. Citing case study, this paper will endeavour to illustrate the economic benefits of hydrography in the Canadian Arctic, with focus on reducing the costs associated with shipping goods and materials. Article 8: Why a National Hydrographic Service? This article is intended to generate discussion around the need and justification for a maritime state to have a national hydrographic office tailored to its real needs. Giving some examples, it is made known the influence and relationship of hydrography and several activities, different that shipping and defence, has. The existence of a National Hydrographic Committee or similar body is highlighted as the most appropriate coordination mechanism. Finally it is recalled the role of the IHO in supporting hydrographic capability development. The hydrographic development is very important even though it’s expensive; but it has high economic returns to the country. Papua New Guinea has directly seen current economic expansion in all industry. It has seen the international vessels of all size call into the coastal waters and harbours. The Papua New Guinea government has made a right decision to update all its nautical charts to modern datum (WGS84) with the assistance from Asian Development Bank. With the long relationship and the Memorandum of Understanding regarding Hydrography between PNG and Australia has put PNG hydrographic service in good position to update its charts to modern datum. Bayelsa State is a state in southern Nigeria in the heart of the Niger Delta. It is on the coast and between Delta State and Rivers State. It covers an area of 10,773 sq. Km. and has a population of 1,998, 349 (2005 estimate). Bayelsa has a riverine setting, a lot of her communities are almost (and in some cases) completely surrounded by water, hence making these communities inaccessible by road. It has one of the largest crude oil deposits in Nigeria and petroleum production is extensive in the state. The majority of Bayelsans, who live in poverty, are rural dwellers due to its peculiar terrain, lack of adequate transportation and poor road access. This has posed a large problem to the State since its creation and successive State Governments have not been able to fashion a way out. Apart from the subsistence fishing and canoe making, the state has virtually no stable commercial activity. It heavily depended on royalties (taxes) on crude oil pipeline and Federal Government Allocation. As a result reclamation would necessitate the availability of the required land space that will be needed for agrarian activities, industrialization, commercial activities (establishment of markets) and the development of a transport system, especially roads that will encourage inter-relationship of the people and advancement of the area and the people. For now, the area is grossly untapped and closed to the open world because of the flooded and swampy nature of the terrain. To this extent, it is only land reclamation that can catapult this rather backward community to its prime of place amongst the community of elegant States of Nigeria. Saipem Camp is a case study where this problem can be effectively articulated, the extent to which Reclamation can meet this challenge, the attendant costs and the impact the solution(s) will have on the people and the State. The Norwegian Hydrographic Service (NHS) and the Hydrographic Institute of the Republic of Croatia (HHI) have successfully carried out a joint project named the Croatian-Norwegian Hydrographic Information Project (CRONO HIP). The main goal of the project was to provide the Hydrographic Institute of the Republic of Croatia with new technology and methods for data collection, data management and nautical chart production. The project was carried out in co-operation between the Norwegian Hydrographic Service and the Hydrographic Institute of the Republic of Croatia. Jeppesen Marine was elected industry partner by international tender. In addition to drawing from experience that the Norwegian Hydrographic Service had acquired from their own recent MINTEC (Maritime Infrastructure - New Technology for production/management of Electronic Navigational Charts and paper charts) project, the CRONO HIP project built also on experiences gained during the Croatian Norwegian Geographic Information Project (CRONO GIP), supporting the topographic mapping activities in Croatia through support to the State Geodetic Agency (SGA) and the Croatian Geodetic Institute (CGI). With its suite of software specially designed for hydrographic and marine applications, CARIS can help generate economic benefits from marine geospatial data. Economic benefits will arise from the extension of the maritime states’ sovereign territory under the United Nations Convention on the Law Of the Sea (UNCLOS). In this case, CARIS LOTS provides geodetic calculation and analysing tools to better process and interpret bathymetric data. Deep bathymetric data is required to define the 2500 m isobath and the morphological foot of the slope, both of which are used in the definition of criteria for delimiting the extension of the juridical continental shelf under Article 76 of UNCLOS. 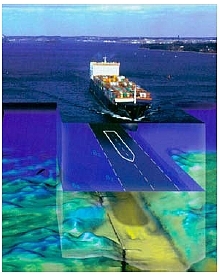 Once defined or resolved (in the case of disputed boundaries) the maritime limits and boundaries geospatial information can help generate revenue from offshore resources and their management. The collection, processing and analysis of hydrographic data are highly technical processes requiring specialize training and education. Personnel lacking in either of these areas run the risk of negating the validity of the information derived from a survey, leading to the need to re-survey; or even worse, leading to incorrect decision making based on faulty information. The costs in personnel and ship time surrounding hydrographic surveys are extensive. The economic impact of erroneous decisions based on bad information is immeasurable. Competent hydrographers must be both well trained and well educated. Traditionally, training and education have been dealt with separately. Vendors of modern hydrographic instruments and software are in an excellent position to help combine the two. Collaboration between hydrographic organization, hardware and software vendors, and academia can lead to the development of education/training modules that would benefit all in the industry. For twenty years the seaport Hamburg has offered a study program for hydrography students. Since several years the course is certified by the International Hydrographic Organization (IHO) as a Category A course. In the beginning of 2006 the „Hamburg University of Applied Sciences“ changed to „HafenCity University, Hamburg“(HCU). In February 2006, the first Master of Science graduates left the university. The working and research group Hydrography mainly uses two vessels for education. One of them, the Level-A, has been constructed mainly for educational and research purposes. The equipment on board consists of a modular system including precise GPS positioning and attitude determination, precise INS attitude determination, multibeam echosounder and a parametric sediment echosounder. The students learn processing of the data with different tools like CARIS-HIPS and in projects and investigations for coastal zone management with ESRI products. However, professional education should approach practical applications. A newly founded company takes on one hand advantage of the equipment and on the other hand helps the university financing the use of the survey vessels and to give their students an insight into practical surveys. In times when universities reduce the possibilities for an education in hydrographic surveying, the HCU offers a new approach. The working group inside the Department of Geomatics plans to take part in projects of capacity building and offers an international English spoken master course. The article presents the new concept of the professional education in Hydrography and a short overview of the equipment and processing software used at the HCU. Oil Tanker M/V Tuvaq in the (Arctic) Northwest Passage © Canadian Hydrographic Service. 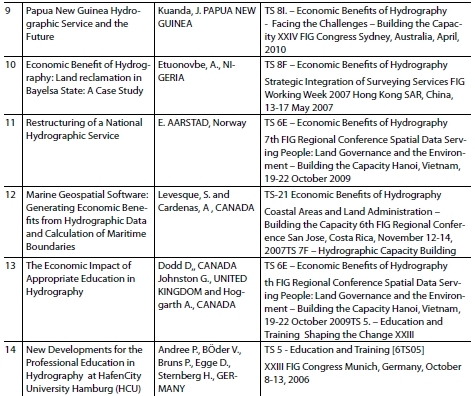 Technical Session on Capacity Building and the Economic Benefits of Hydrography, XXIV FIG Congress, Sydney 2010. Left to right: Brian Connon USA, Gordon Johnston (United Kingdom), Olumide Omotoso (Nigeria), Joseph Kuanda (Papua New Guinea), Rod Nairn (Australia) and Michael Sutherland, Canada. © FIG. Right: Oil Tanker M/V Tuvaq in the (Arctic) Northwest Passage © Canadian Hydrographic Service. Back cover: Technical Session on Capacity Building and the Economic Benefits of Hydrography, XXIV FIG Congress, Sydney 2010. 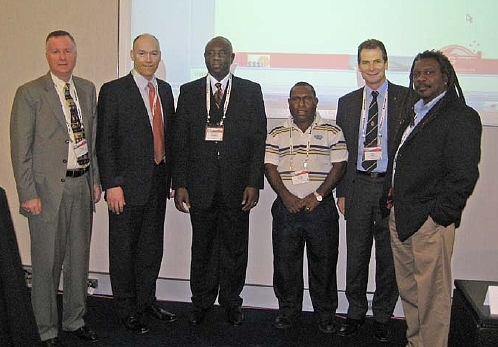 Left to right: Brian Connon USA, Gordon Johnston (United Kingdom), Olumide Omotoso (Nigeria), Joseph Kuanda (Papua New Guinea), Rod Nairn (Australia) and Michael Sutherland, Canada. © FIG.